Everyone’s favorite week out of the kitchen is just around the corner. 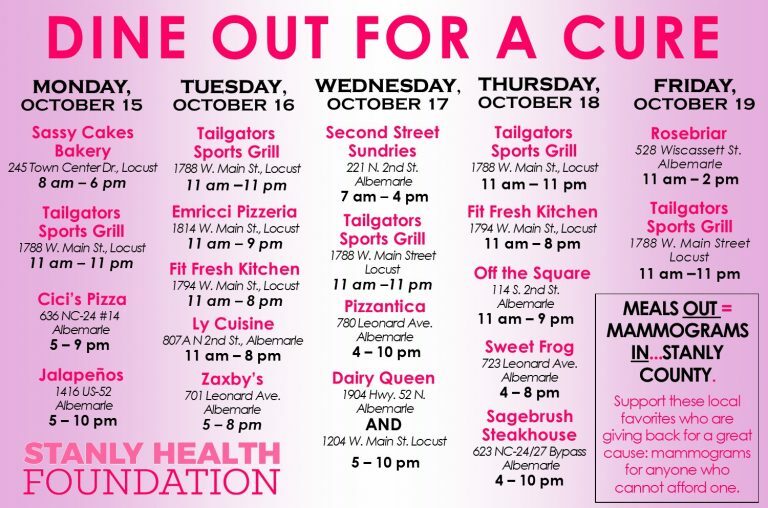 Plan to eat out each day to support the Stanly Health Foundation as we ensure that every woman in our community can have access to a mammogram. And eat out to support these community-minded spots. We couldn’t do it without them! Are you a restaurant owner who wants to participate? Click here for details. We’d love to have you! Join us as we continue to ensure we have strong healthcare in our local community. Your gift will stay here as we work to make our community healthier and stronger every day. Since 2012, Dancing with the Stars has raised over $500,000.